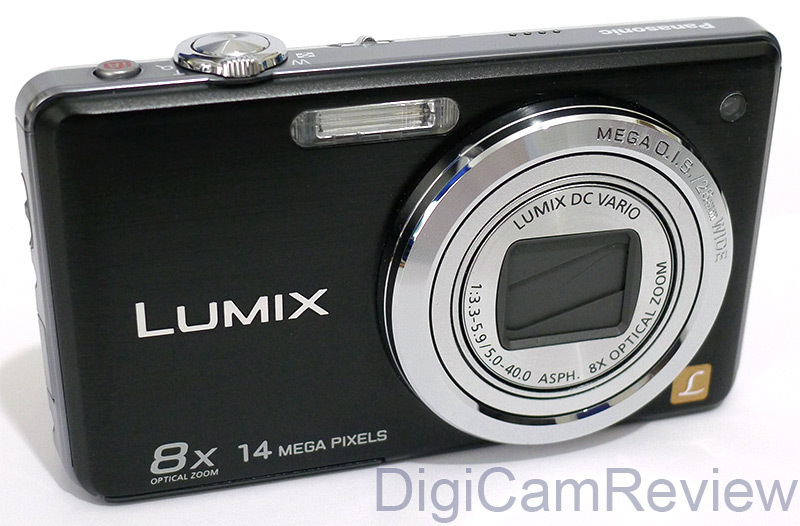 The Panasonic Lumix FS33, is the touch-screen version of the Panasonic Lumix FS30, with a 3.0″ touch screen. 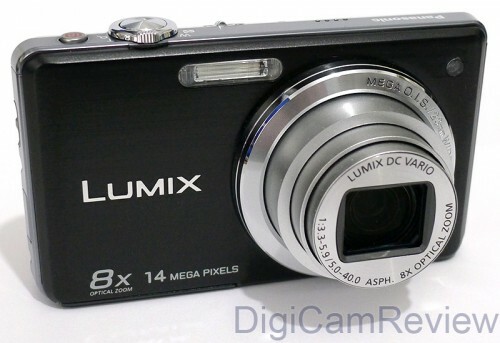 It packs an impressive wide-angle 8x optical zoom lens (28-224mm in 35mm equiv.) into a compact body, and features a 14.1 megapixel sensor, optical image stabilisation, HD video, SDXC support, lithium-ion rechargeable battery, and face detection. The Panasonic Lumix FS33 is available in black, red or silver for £139-£149, and the Panasonic Lumix FS30 is available in black, blue, silver, violet for £116. Lets look at the camera in more detail. The front of the camera – focus assist lamp, 8x optical zoom lens, flash. Panasonic Lumix FS33 vs FS30: The FS33 features a 3.0″ touch screen that has: Touch Area on screen for AF metering, and an Anti-Reflective Coating, the screen doesn’t let you press an area and then take a photo, you still need to use the shutter release to take the photo after focusing with the touchscreen. The resolution is 230k pixels, the same resolution as the 2.7″ screen on the FS30. Other than the difference in the screen, there are no other differences between these cameras, other than the price and available colours. 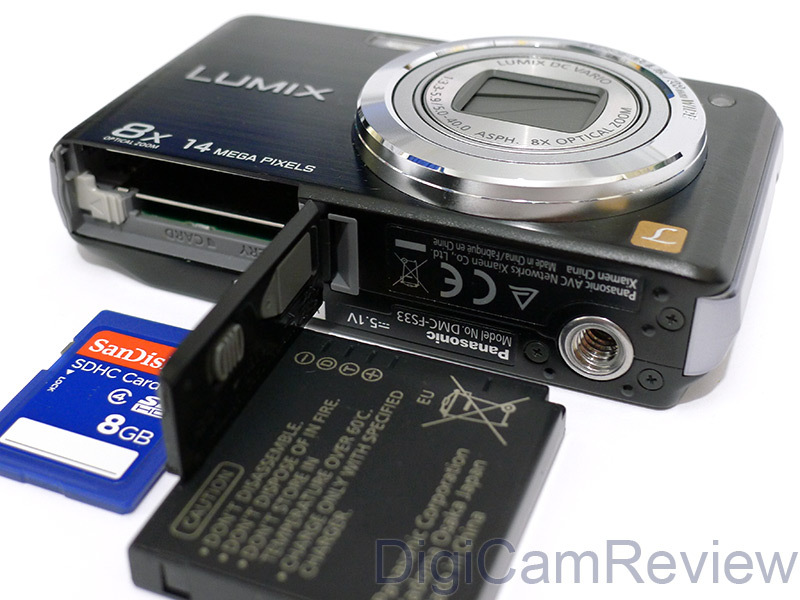 Panasonic Lumix FS33 Back – The back of the camera features a 3″ screen with 230k pixels. 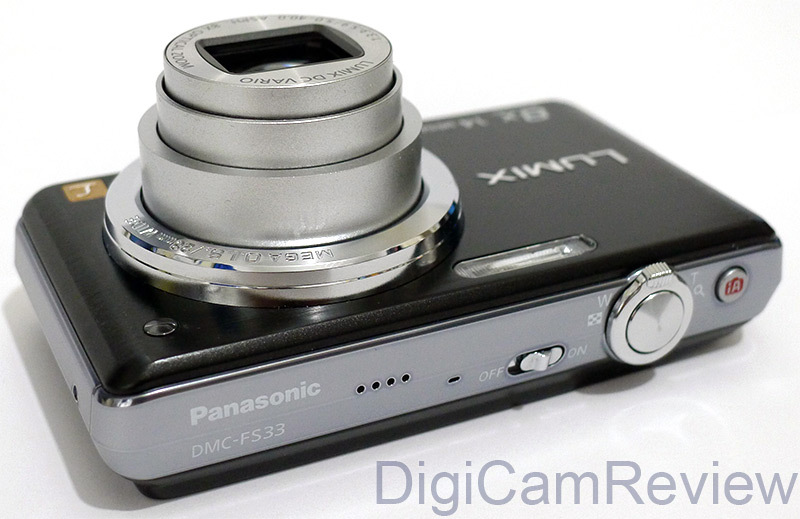 Panasonic Lumix FS33 Top – The top of the camera. Box contents: Camera, CD-Rom (PhotoFunStudio 5.0, Manuals), Manuals (basic printed manuals for camera, software), lithium ion battery, battery charger and cable, wrist strap, usb and av cables. No supplied SD card, just some built in memory (40mb). Camera Bottom – tripod mount, battery / memory compartment. Battery life: Battery life is rated at 300 shots according to CIPA standards. I was able to take around 200 photos before the battery went flat. This is average for a compact camera. As the camera uses lithium ion batteries, a spare is recommended. Recommended accessories: A large SD or SDHC memory card, 4gb or larger is recommended: SD Cards at Amazon: 1GB, 2GB. SDHC Cards at Amazon: 4GB, 8GB, 16GB, 32gb. A case is also a must buy for any digital camera, the Lowepro Rezo 20 fits the Panasonic Lumix FS33/FS30 snuggly, and if you want a bit more room, and a weatherproof case, have a look at the Lowepro Apex 20AW. Ease of use / Menus: The touch screen system / menus / operation / buttons are probably the most awkward aspect of using this camera. Unfortunately it’s not just me, others who have used this camera have found it difficult and counter-intuitive to use, resulting in frustration and missed shots. Playback is particularly frustrating as you can’t seem to hold the (small) arrow buttons to scroll around the pictures making reviewing the images in detail very slow. Likewise navigating the menus can be slow and difficult compared to a normal camera with buttons. For this reason alone, it is worth looking at the FS30 instead (or hoping newer Panasonic touchscreens perform better). Buttons / Ergonomics: The buttons that the camera features are decent, slightly on the small side. The mode button is slightly recessed to avoid accidentally pressing it, however I would have much prefered a mode dial, as you often need to press the mode dial to confirm the mode you are in. The camera design and build quality are good, with a metal body, however the front is quite slippery with no hand grip – there’s also very little on the back to hold on to, as the back is dominated by the large touch screen. 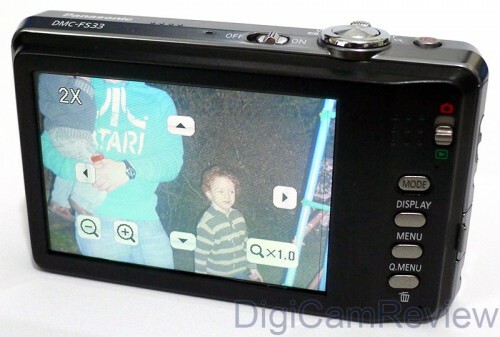 Video: The camera recorded HD videos at 1280×720 at 30fps, with mono sound, as a Quicktime Movie (.MOV) file. Unfortunately optical zoom isn’t available when recording, and has to be set before recording any video. Quality seems good. ISO / Noise / Low light performance: The Panasonic Lumix FS33 has ISO options from ISO80 up to ISO1600. You are best trying to stick to ISO80 to ISO400, as detail and colour start dropping off when you go up to ISO800. When you go up to ISO1600 detail and colour dramatically drops off, so is best not used at all. ISO800 can be used in some circumstances but isn’t recommended. At ISO400 and below the results are quite good, and luckily the camera rarely uses ISO800, and hardly ever uses ISO1600 when on automatic modes. In normal modes the slowest shutter speed is 1/8th of a second, so you may find you need to bump the ISO speed every now and again, or try and find a suitable scene mode. Conclusion: Touch screens, when implemented well, as in the Samsung ST550, can make a good camera great, and make it a joy to use, however, when implemented poorly, they can make a good camera bad. Unfortunately the Panasonic Lumix FS33 features an awkward touch screen that makes it especially awkward to use, and sometimes downright frustrating. You can save a lot of money and have a much more enjoyable camera by simply buying the cheaper Panasonic Lumix FS30, a camera, that thankfully doesn’t feature a touchscreen, and instead uses quicker and easier to use controls. Other than the awkward touch screen, the FS33 is a good all round camera with good image quality, good features, and a stylish and compact metal body. 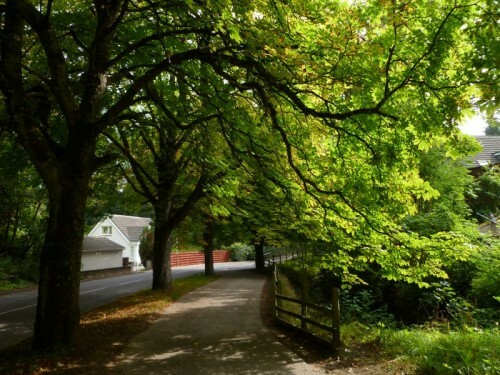 – Good detail and colour, good lens quality. – The touch screen – the non-touch screen version is easier and quicker to use. Tested with Panasonic Firmware v1.0 – More on the FS33 on Panasonic’s website.